Thanks to some 20th Century cultivation and upkeep, those same seven springs still water a large area of land adjacent to the northern shore of the Sea of Galilee providing an array of greenery. It’s essentially a year round oasis of verdant peace and tranquility with the famous lake as a backdrop. There is little of the hustle and bustle of many other Biblical Holy Land sites. The staff of the site insist on an atmosphere of quiet reverence. The Bible tells a few things about the location of the miracle of the feeding of the five thousand (not counting women and children). The first is that it was a remote location. After all, Jesus and His disciples originally went there to retreat for a while after the news of the beheading of John the Baptist by Herod. However, Jesus still found a large crowd of people when they landed on the shore and felt moved to minister to them (Mark 6:34). Archeology and historical records show that there has never been more than a handful of people living at Tabgha. It’s also a couple of miles walk from the nearest village of Capernaum. As the setting of feeding of the 5000 miracle, it meets the criteria of being away from a village and being directly on the northern shore of the Sea of Galilee. It would have been a series of tiresome walks back and forth even from Capernaum with heavy baskets for the disciples which would have been time prohibitive considering the large crowd to be fed. 3. Tabgha offers two holy sites for the price of one. 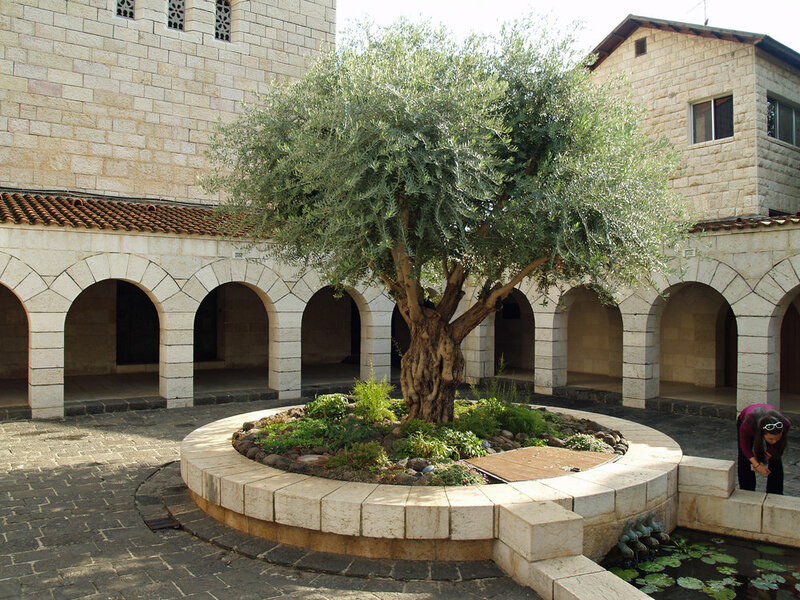 Within the confines of the Tabgha property are at once the traditional site of the feeding of the five thousand miracle as well as the traditional site of primacy of Peter (Peter’s reconfirmation by Jesus after the Resurrection – John 21). There are the ancient remains of two individual churches in two different spots as well as longstanding written and oral traditions to support both. One bus or car stop – two important sites. You can easily walk between them. As with many Holy Land sites, the first church structure to commemorate the site of the miracle of the multiplication was built in the 300s AD (4th Century) by the Byzantine Romans. This is because it was not until then that Christianity was legal in the Roman Empire. Being only a few generations removed from the actual event, there was already a strong tradition passed down regarding the authenticity of the site. The modern 20th Century church is a close reproduction of the second variant of Byzantine church expansion of the 5th century. The church incorporated much of the original layout and indeed a little of the building materials of the church left in ruins by the Persian and Arab conquests of the 7th century. Of special interest are the floor mosaics left intact from the Byzantine church of Patriarch Matryrios. In the center of the altar area is a mosaic of loaves and fish. The fish represented however have too many fins to represent any fish found in the Sea of Galilee today. Many of the plants and animals shown in mosaic form, although beautiful and clearly the work of a master artist are actually native to nearby Egypt. As Patriarch Matryios was from Egypt, this is a likely explanation. At the central loaves and fish mosaic there is a rectangular rock outcropping carved with a finely hewn stylized cross. The rock is the rock that according to tradition where Jesus blessed the pre-miracle loaves and fish. Located directly of the shore of the Sea of Galilee is the small Franciscan chapel marking the location of the reinstatement of Peter by Jesus. Here Jesus asked Peter, according to John 21: “Do you love me” three times and replying to Peter’s emphatic affirmative answer – all three times – “Feed my sheep.” The original byzantine chapel of the 4th century notably survived the Persian/Arabian conquests of the 7th Century until the 13th century. As a result, some of the earlier structure’s building material was faithfully incorporated into its 1930’s rebuilding. The site marks the stone where, according to tradition, Jesus was preparing breakfast at Peter’s arrival.